Almost 20 years ago I received a cookbook that shared recipes from bed & breakfast inns in the Pacific Northwest. It was once a dream of mine to own a bed & breakfast and I think that's what inspired the gift. One of our family's go-to recipes comes from this cookbook. Wake Up & Smell the Coffee is compiled by Laura Zahn. After a little searching it looks like you can find this edition and its sister publications through second-hand bookshops. It's a nice compilation of stories behind the inns and recipes they share. Our favorite recipe comes from Stange Manor in Oregon for 60-Minute Cinnamon Rolls. In all the years that we've made these rolls, we have never been able to make them in 60 minutes, hence the name change. The timing doesn't take away from how good these cinnamon rolls are, just gives you a more realistic time frame. This recipe only requires one rising which speeds up the overall process. It's also made as an upside down sticky bun. 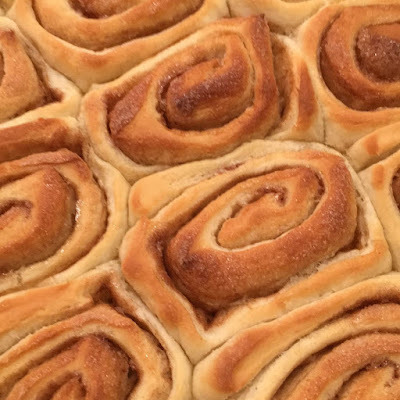 The toppings are placed on the bottom of the pan and then the rolls are inverted after baking so all the gooey yumminess sinks down into the baked rolls. These rolls aren't served with icing (what?? no icing??) but you'll find it's not needed. And, should you have any leftovers, they reheat very well in the microwave. In the bowl of a stand mixer combine 1½ cups flour, sugar, salt, and dry yeast. Gradually add the warm liquid to the dry ingredients. Beat 2 minutes at medium speed, scraping bowl occasionally. Add ½ cup flour and beat on high speed for 2 minutes. Add in additional flour, ½ cup at a time, until a soft dough is formed. You may not need all the flour, you may need a little more. Add enough so the dough isn't wet and sticky. Turn the dough out onto a lightly floured board and knead until smooth and elastic, about 5 minutes. While the dough is rising, cover the bottom of a 9" x 13" pan with the topping ingredients. In a separate bowl, mix the cinnamon and sugar for the filling. Preheat the oven to 375˚ F. After the 15 minute rise, turn the dough out onto a lightly floured board. Roll out to a 10" x 18" rectangle. Spread the dough with the softened butter then sprinkle evenly with the cinnamon-sugar mixture. Roll the dough lengthwise like a jelly roll. Cut into 18-1" slices. Please the rolls, cut side up in the pan. Bake in the preheated oven for 25 minutes. Invert the pan onto a serving tray while still warm and serve.